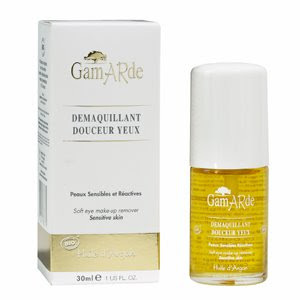 I am so LOVING Gamarde Eye & Lip Organic Makeup Remover!! You must dampen your Cotton Wool Pad first (I used my favourite Pukka Rosewater) and then add a few drops of the product. Press this gently into the pad, then hold the pad over the eyelid and sweep downwards and outwards to gently remove all eye make-up. The Gamarde Eye & Lip Organic Makeup Remover is beautifully gentle and extremely effective and thanks to Argan’s oily texture it enables you to remove all traces of makeup with an extreme softness, even if water-resistant. It occurred to me whilst using this that as well as investing in a great eye cream (Trilogy Eye Contour Cream is my current favourite!) We should all invest in a great eye makeup remover too! One that does not drag or pull the skin around the delicate eye area such as this. Oh and I almost forgot - this stuff removes lipsticks and glosses too!